Idina Menzel and Kristin Chenoweth reunited to perform together for the first time in 12 years! The duo sang “For Good”, their iconic duet from Wicked, as part of Wicked’s YouTube series Out of Oz: Wicked Studio Sessions, which features Wicked alumni and current performers singing reimagined versions of songs from the hit musical. Idina Menzel participated in Tribeca Talks: Storytellers in NYC yesterday. Idina spoke with Marc Platt, who produced Wicked about her career and experiences. You can watch most of the conversation above. Playbill.com has a great write-up of the event, as well as the Tribeca Film website. Idina’s NYC Frozen Sing Along! Calling all Disney FROZEN Fans! Idina Menzel, Bobby Lopez and Kristen Anderson-Lopez are reuniting to throw an amazing family party and sing-along – all while doing good! 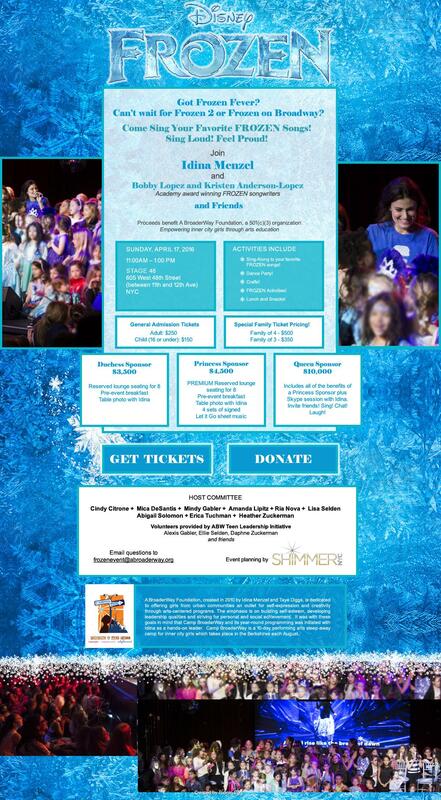 Sing Along to all your favorite Frozen songs with the original Elsa and the writers of FROZEN on April 17 in NYC. Lunch, party games, indoor snow area, DJ, photo booth and lots of fun surprises will make this a special experience. Proceeds will benefit Idina’s Camp BroaderWay, which empowers inner city girls through arts education. You may recall that Idina recently paired up with Kristen Bell and Josh Gad in L.A. for a similar benefit, which received rave reviews! Individual tickets are $250 and there are various sponsorship levels for larger donations. If you can swing a $10,000 donation, you’ll get a Skype session with Idina! 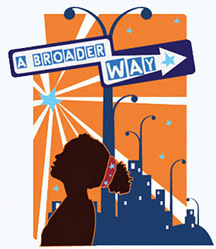 Get all the details at: http://abroaderway.org/ny-sing-along/ and check out the ad below. While everyone who runs or has run Idina-Here does it because we love Idina and working on the site, we can’t possibly do it all alone and help is always appreciated. Idina-Here.com is a not-for-profit fansite made by the fans for the fans. The staff of this site is in contact with Ms. Menzel's representation, but any e-mails sent to us will not be read by her. All contact information is confidential. All photographs featured are copyright of their respective owners. No infringement is intended.